Things started well with my very first 3D printer, but as time went on, I realized I was ready to upgrade to something with better reliability and capabilities. After careful research, I bought the Wanhao Duplicator i3. It is in the same price category as my first printer, and takes the same plastic filament, allowing me to reuse some of my existing rolls of filament. To make space for new kinds of filament, I did sell 10 of my 18 rolls of filament on Kijiji. The new printer has a more open design, which makes it easier to see what it’s doing. It takes up more counter space though, as the power supply and LCD display is a separate box. However, I can take the computer away, and print from just an SD card with this printer. I bought the yellow polyetherimide (PEI) sheet on the print bed for my old printer, and was able to use it with the new printer. It offers superior adhesion compared to alternatives, without much maintenance or cleanup needed for a print. By default, the new printer comes with a “builktak” surface which wears out over time. Some of the key print capabilities are theoretically similar to my old printer, except this one uses more common parts, and does a better job. My new printer does have a wider range of supported filament types, including PLA which is very popular. Any consumer-level 3D printer requires lots of calibration and tinkering to achieve the best results. However, the new printer is already working very well for me, and more consistently than my old printer. My old printer always had trouble printing these designs shown above, even though they’re supposed to be quite easy to print on any printer. 3D Benchy, a popular test print, looked terrible when using my old printer (left). My new printer, using the same material, did much better (right), although I can’t remember if I used a different layer height or not. 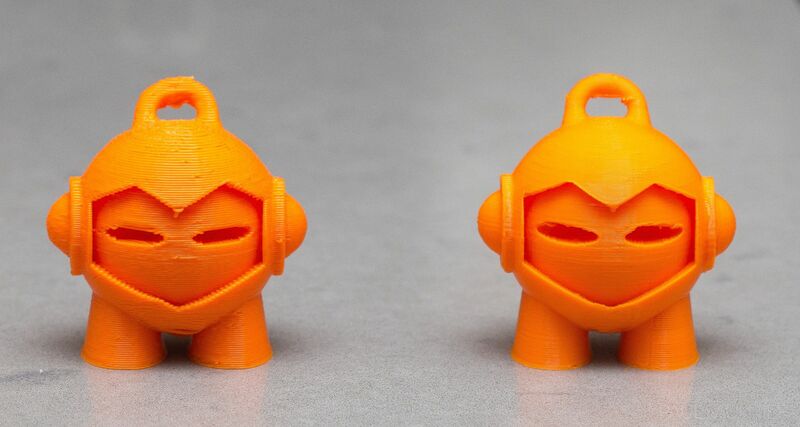 Marvin, the 3D Printing mascot, is not quite as dramatic in differences. The new one (right) mainly looks better because I used a smaller layer height (which my old printer could have done too), but there are other details such as the eyes which are noticeably better on the new printer.